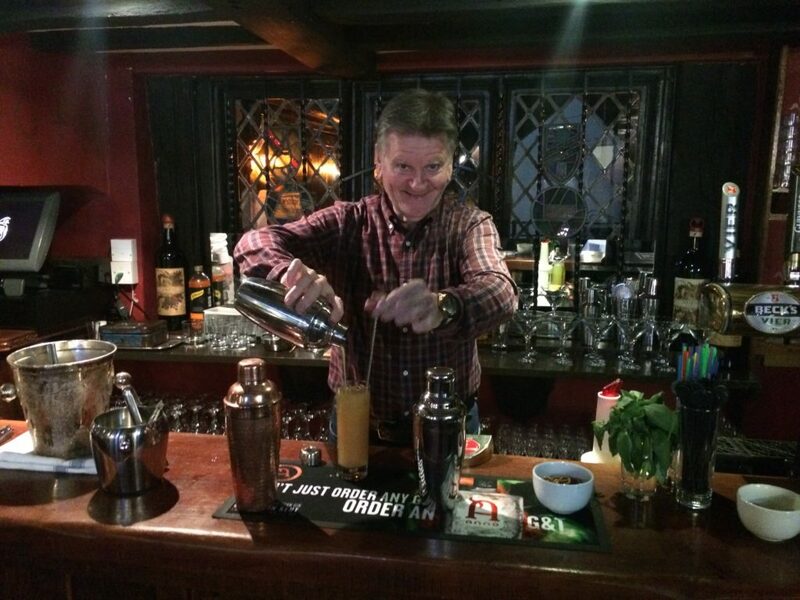 The Rye News Gin Trail last week ended with an evening of cocktails at the Mermaid on Friday. While less well attended than the previous week’s sloe gin competition, this was more than made up for by both the atmosphere of the surroundings and the superlative professionalism of mixologist Chris Cogan who produced inventive cocktails based, on this occasion on sloe gin, ranging from a sloe collins (sloe gin, lemon juice, sugar syrup and soda) to the frightening Alabama Slammer (sloe gin, amaretto, Southern Comfort and orange juice). No one had managed the entire gin trail this year, but had they done so, they might have come across Anno dry gin distilled locally (almost) in Marden, Kent. The distillers were present during the evening with sample measures and should readers wish to try this excellent product, it is available from a number of retailers and supermarkets, the nearest to Rye being the Farm Shop at East Guldeford. Thanks go to the Mermaid and Judith Blincow, willing, as ever, to encourage something new and we hope to be back there, bigger and better, next year.